New Delhi loses a maximum of Rs 63k crore as social cost of congestion; travel during peak hour takes an average of 162% more time in city. 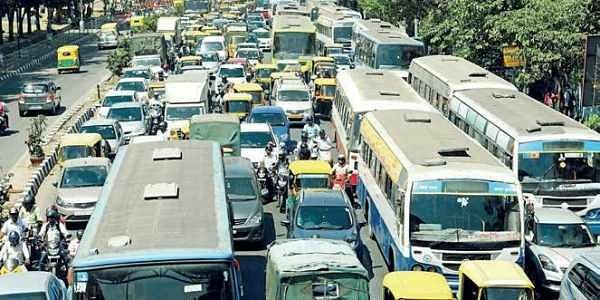 BENGALURU: The city loses a whopping Rs 38,000 crore (5.92 Billion USD) every year as the social cost of traffic congestion. Travel during peak hour traffic takes an average of 162% more time than the same distance travelled during off peak hours. This is second only to Kolkata among major Indian cities measured according to a study by the Boston Consulting Group commissioned by taxi aggregator Uber. Social costs of congestion include time delays, extra fuel spent, costs due to traffic accidents, vehicle loss, wear and tear as well as environmental issues. In fact, Bengaluru’s traffic places it below cities like Singapore, Hong Kong, Bangkok and Manila when it comes to time taken to travel during peak hours, the study has shown. In terms of costs, New Delhi loses the most with the social cost of congestion standing at D63,000 crore (9.60 Billion USD) annually. The report, which groups Bengaluru and Kolkata in similar groups owing to their smaller size in terms of population, states that these two cities have less modern and more road-based public transport networks. “For Kolkata and Bangalore, congestion levels are relatively higher than in other cities, despite their smaller populations. This is driven by the limitation of their older public transport networks which are primarily road-based, along with a significant growth in private vehicles. Looking forward, a combination of infrastructure improvement, addition of more modern mass transit as well as efficient alternatives to vehicle ownership are likely to help curb congestion,” the report states. In Bengaluru’s case, rail-based projects like Namma Metro or sub-urban rail, while effective, the capacity will not be sufficient to bring down congestion levels by the time they are fully operational. “We estimated that the added rail transport capacity still falls below the required level to maintain its congestion levels by 2022. According to our estimates, additional rail public transport adoption of close to 21% of total kilometres in the city is essential, in conjunction with public transport, to maintain today’s congestion levels.” A survey conducted by the group showed that Bengaluru and New Delhi respondents were less enthusiastic about buying a car in the next five years. Bengaluru: Ridesharing and carpooling are some of the major solutions to the city’s traffic woes. An estimated Rs 8,000 crore (1.30 Billion USD) in social costs could be saved annually with the widespread adoption of shared rides and carpooling solutions. This is from an estimated 17% drop in road congestion during peak hours if rideshare solutions are widely adopted, the report finds. Discussing the benefits for the city by adoption of ridesharing, the report says that the availability of an affordable and dependable rideshare solution would mean that people would consider foregoing the option of purchasing a car entirely. Rideshares could also help serve outlying areas which are not feasible for mega public transport projects. Around 27% of those surveyed in the city also indicated that they would be willing to sign up to drive with a taxi aggregator to supplement their income. An estimated 40% of the city’s cars and 8% of the total vehicles in the city could be taken off the roads if ridesharing options replace private vehicles as the preferred choice of transport, the report finds. The BCG report states that a large section of potential users found availability of cabs as a major deterrent to adopting rideshare options.